Get Even More Results From Your Neurometer® With a Neuval® Software Upgrade! When you update your Neurometer's software package you'll enjoy many important advantages. The new, Microsoft Windows-compatible Version I2100 of the Neuval® DBII CPT Evaluation and Database Software offers a world of time-saving protocols and objective clinical documentation that today's healthcare environment demands. 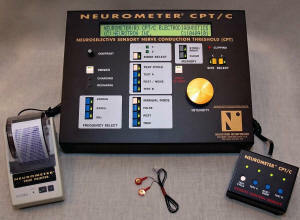 Is it Time to Upgrade Your Neurometer?